Escape to Sicily for seven days of beauty, cuisine, and history—without the crowds you’d find in the high-season. Begin in Palermo and meet your Tour Director and traveling companions for a welcome dinner at your hotel. Spend the following day on a guided sightseeing tour of Palermo’s ornate Piazza Bellini and Capo Market. See the stunning baroque features of the Church of the Immacolata, and visit the historic Palermo Cathedral. Enjoy the panoramic view of the Conca d’Oro in Monreale, and visit the 12th-century Norman Cathedral with its treasured byzantine mosaics. Walk through the 24-centuries-old Valley of the Temples with your Local Guide in Agrigento, visit Piazza Armerina’s Villa Romana del Casale to admire the world’s largest collection of Roman mosaics. In Syracuse, the birthplace of mathematician Archimedes, you’ll take a guided visit to the archaeological site of the 5th-century-BC Greek Theater, Garden of Paradise, Ear of Dionysus, Altar of Hieron II, Roman Amphitheater, and the Cordmaker’s Cave. 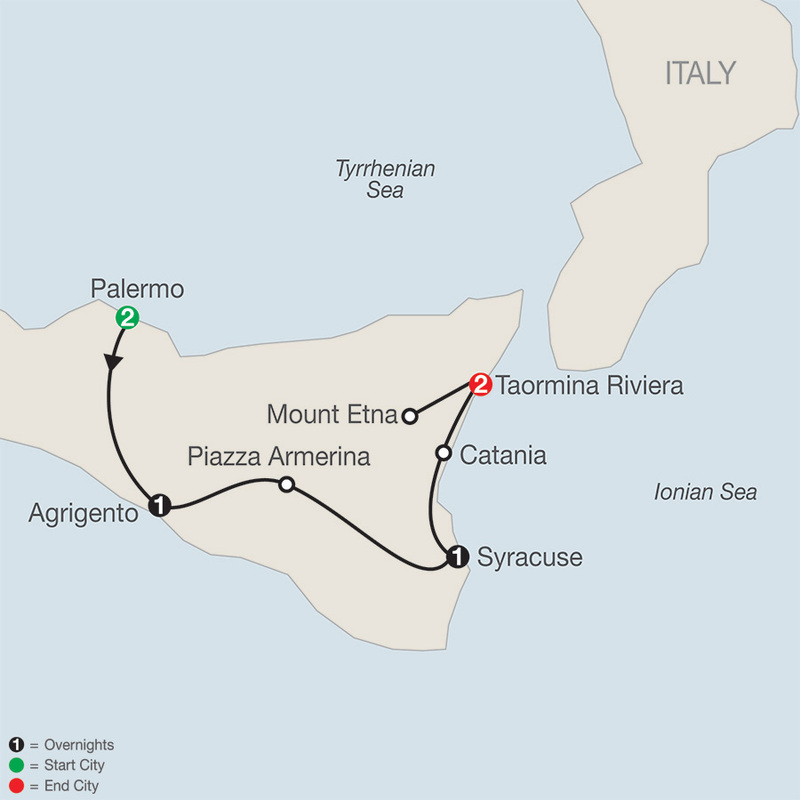 Travel to Catania, where you’ll sample Sicily’s famous Arancino, and spend two nights on the spectacular Taormina Riviera, your base for a fascinating excursion to Mount Etna—the largest active volcano in Europe. Explore Taormina, and complete your Sicilian Escape with a fabulous farewell dinner at a local restaurant. You’ll treasure the time spent exploring Sicily’s famous sights and stunning scenery—without the crowds of the busy travel season on this spectacular guided tour of Sicily! A fusion of classic and innovative design, Hotel Federico II is a family- run 65 room establishment located near the city's most important streets of culture, tourism and shopping, halfway between the Teatro Massimo and the Teatro Politeama. Breakfast is served with a rich buffet while the in-house restaurant offers traditional Mediterranean dishes revisited along with a great wine selection. Free WiFi access is available throughout the property. The modern, comfortable Mercure Siracusa Prometeo offers 93 rooms with all the comforts. The hotel has a bar/bistro, a fitness room and a wellness center. In Summer a roof panoramic outdoor swimming-pool with a solarium area on the 6th floor will be available. Free Wi-Fi connection is available throughout the property. Hellenia Yachting Hotel is an elegant 4-star hotel in Giardini Naxos, the first Greek colony of Sicily. The property is directly overlooking the waterfront and features a private beach, a spa and a pool. There is a piano bar located in the main terrace area and immediatly adjacent to the main in-house restaurants which boasts some of the finest Sicilian cuisine, presenting traditional local dishes with a fresh and original touch.